Lithium aluminium hydride, commonly abbreviated to LAH, is an inorganic compound with the chemical formula LiAlH4. It was discovered by Finholt, Bond and Schlesinger in 1947. This compound is used as a reducing agent in organic synthesis, especially for the reduction of esters, carboxylic acids, and amides. The solid is dangerously reactive toward water, releasing gaseous hydrogen (H2). Some related derivatives have been discussed for hydrogen storage. LAH is a colorless solid, but commercial samples are usually gray due to contamination. This material can be purified by recrystallization from diethyl ether. Large-scale purifications employ a Soxhlet extractor. Commonly, the impure gray material is used in synthesis, since the impurities are innocuous and can be easily separated from the organic products. 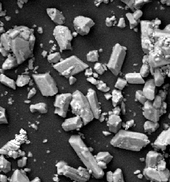 The pure powdered material is pyrophoric, but not its large crystals. Some commercial materials contain mineral oil to inhibit reactions with atmospheric moisture, but more commonly it is packed in moisture-proof plastic sacks. This reaction provides a useful method to generate hydrogen in the laboratory. Aged, air-exposed samples often appear white because they have absorbed enough moisture to generate a mixture of the white compounds lithium hydroxide and aluminium hydroxide. The crystal structure of LAH; Li atoms are purple and AlH4 tetrahedra are tan. 4 tetrahedra. The Li+ centers are bonded to one hydrogen atom from each of the surrounding tetrahedra creating a bipyramid arrangement. At high pressures (>2.2 GPa) a phase transition may occur to give β-LAH. X-ray powder diffraction pattern of as-received LiAlH4. The asterisk designates an impurity, possibly LiCl. which proceeds in a high yield. LiCl is removed by filtration from an ethereal solution of LiAH, with subsequent precipitation of LiAlH4 to yield a product containing around 1% w/w LiCl. An alternative preparation starts from LiH, metal Al instead of AlCl3. Catalyzed by a small quantity of TiCl3 (0.2%), the reaction proceeds well using dimethylether as solvent. This method avoids the cogeneration of salt. LAH is soluble in many ethereal solutions. However, it may spontaneously decompose due to the presence of catalytic impurities, though, it appears to be more stable in tetrahydrofuran (THF). Thus, THF is preferred over, e.g., diethyl ether, despite the lower solubility. The table summarizes thermodynamic data for LAH and reactions involving LAH, in the form of standard enthalpy, entropy, and Gibbs free energy change, respectively. Li (s) + Al (s) + 2 H2(g) → LiAlH4 (s) −116.3 −240.1 −44.7 Standard formation from the elements. LiH (s) + Al (s) + ​3⁄2 H2 (g) → LiAlH4 (s) −95.6 −180.2 237.6 Using ΔH°f(LiH) = −90.579865, ΔS°f(LiH) = −679.9, and ΔG°f(LiH) = −67.31235744. LiAlH4 (s) → LiAlH4 (l) 22 – – Heat of fusion. Value might be unreliable. LiAlH4 (l) → ​1⁄3 Li3AlH6 (s) + ​2⁄3 Al (s) + H2 (g) 3.46 104.5 −27.68 ΔS° calculated from reported values of ΔH° and ΔG°. LAH is metastable at room temperature. During prolonged storage it slowly decomposes to Li3AlH6 and LiH. This process can be accelerated by the presence of catalytic elements, such as titanium, iron or vanadium. 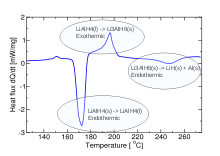 Differential scanning calorimetry of as-received LiAlH4. R1 is usually initiated by the melting of LAH in the temperature range 150–170 °C, immediately followed by decomposition into solid Li3AlH6, although R1 is known to proceed below the melting point of LiAlH4 as well. At about 200 °C, Li3AlH6 decomposes into LiH (R2) and Al which subsequently convert into LiAl above 400 °C (R3). Reaction R1 is effectively irreversible. R3 is reversible with an equilibrium pressure of about 0.25 bar at 500 °C. R1 and R2 can occur at room temperature with suitable catalysts. Lithium aluminium hydride is widely used in organic chemistry as a reducing agent. It is more powerful than the related reagent sodium borohydride owing to the weaker Al-H bond compared to the B-H bond. Often as a solution in diethyl ether and followed by an acid workup, it will convert esters, carboxylic acids, acyl chlorides, aldehydes, and ketones into the corresponding alcohols (see: carbonyl reduction). Similarly, it converts amide, nitro, nitrile, imine, oxime, and azide compounds into the amines (see: amide reduction). It reduces quaternary ammonium cations into the corresponding tertiary amines. Reactivity can be tuned by replacing hydride groups by alkoxy groups. Due to its pyrophoric nature, instability, toxicity, low shelf life and handling problems associated with its reactivity, it has been replaced in the last decade, both at the small-industrial scale and for large-scale reductions by the more convenient related reagent sodium bis (2-methoxyethoxy)aluminium hydride, which exhibits similar reactivity but with higher safety, easier handling and better economics. LAH is most commonly used for the reduction of esters and carboxylic acids to primary alcohols; prior to the advent of LiAlH4 this was a difficult conversion involving sodium metal in boiling ethanol (the Bouveault-Blanc reduction). Aldehydes and ketones can also be reduced to alcohols by LAH, but this is usually done using milder reagents such as NaBH4; α, β-unsaturated ketones are reduced to allylic alcohols. When epoxides are reduced using LAH, the reagent attacks the less hindered end of the epoxide, usually producing a secondary or tertiary alcohol. Epoxycyclohexanes are reduced to give axial alcohols preferentially. Partial reduction of acid chlorides to give the corresponding aldehyde product cannot proceed via LAH, since the latter reduces all the way to the primary alcohol. Instead, the milder lithium aluminium tri(t-butoxy)hydride, which reacts significantly faster with the acid chloride than with the aldehyde, must be used. For example, when isovaleric acid is treated with thionyl chloride to give isovaleroyl chloride, it can then be reduced via lithium aluminium tri(t-butoxy)hydride to give isovaleraldehyde in 65% yield. Lithium aluminium hydride also reduces alkyl halides to alkanes, . Alkyl iodides react the fastest, followed by alkyl bromides and then alkyl chlorides. Primary halides are the most reactive followed by secondary halides. Tertiary halides react only in certain cases. Lithium aluminium hydride does not reduce simple alkenes or arenes. Alkynes are reduced only if an alcohol group is nearby. 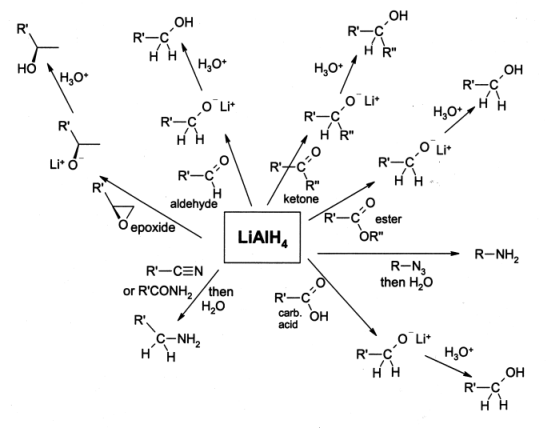 LAH also reacts with many inorganic ligands to form coordinated alumina complexes associated with lithium ions. 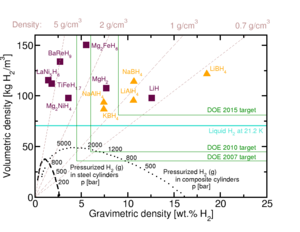 Volumetric and gravimetric hydrogen storage densities of different hydrogen storage methods. Metal hydrides are represented with squares and complex hydrides with triangles (including LiAlH4). Reported values for hydrides are excluding tank weight. DOE FreedomCAR targets are including tank weight. LiAlH4 contains 10.6 wt% hydrogen, thereby making LAH a potential hydrogen storage medium for future fuel cell-powered vehicles. The high hydrogen content, as well as the discovery of reversible hydrogen storage in Ti-doped NaAlH4, have sparked renewed research into LiAlH4 during the last decade. A substantial research effort has been devoted to accelerating the decomposition kinetics by catalytic doping and by ball milling. In order to take advantage of the total hydrogen capacity, the intermediate compound LiH must be dehydrogenated as well. Due to its high thermodynamic stability this requires temperatures in excess of 400 °C, which is not considered feasible for transportation purposes. Accepting LiH + Al as the final product, the hydrogen storage capacity is reduced to 7.96 wt%. Another problem related to hydrogen storage is the recycling back to LiAlH4 which, owing to its relatively low stability, requires an extremely high hydrogen pressure in excess of 10000 bar. Cycling only reaction R2 — that is, using Li3AlH6 as starting material — would store 5.6 wt% hydrogen in a single step (vs. two steps for NaAlH4 which stores about the same amount of hydrogen). However, attempts at this process have not been successful so far. Wikimedia Commons has media related to lithium aluminium hydride. ^ Sigma-Aldrich Co., Lithium aluminium hydride. Retrieved on 2018-06-1. ^ Index no. 001-002-00-4 of Annex VI, Part 3, to Regulation (EC) No 1272/2008 of the European Parliament and of the Council of 16 December 2008 on classification, labelling and packaging of substances and mixtures, amending and repealing Directives 67/548/EEC and 1999/45/EC, and amending Regulation (EC) No 1907/2006. OJEU L353, 31.12.2008, pp 1–1355 at p 472. ^ a b Finholt, A. E.; Bond, A. C.; Schlesinger, H. I. (1947). "Lithium Aluminum Hydride, Aluminum Hydride and Lithium Gallium Hydride, and Some of their Applications in Organic and Inorganic Chemistry". Journal of the American Chemical Society. 69 (5): 1199–1203. doi:10.1021/ja01197a061. ^ a b c d Gerrans, G. C.; Hartmann-Petersen, P. (2007). "Lithium Aluminium Hydride". Sasol Encyclopaedia of Science and Technology. New Africa Books. p. 143. ISBN 1-86928-384-8. ^ Keese, R.; Brändle, M.; Toube, T. P. (2006). Practical Organic Synthesis: A Student's Guide. John Wiley and Sons. p. 134. ISBN 0-470-02966-8. ^ Andreasen, A.; Vegge, T.; Pedersen, A. S. (2005). "Dehydrogenation Kinetics of as-Received and Ball-Milled LiAlH4" (PDF). Journal of Solid State Chemistry. 178 (12): 3672–3678. Bibcode:2005JSSCh.178.3672A. doi:10.1016/j.jssc.2005.09.027. ^ Pohanish, R. P. (2008). Sittig's Handbook of Toxic and Hazardous Chemicals and Carcinogens (5th ed.). William Andrew Publishing. p. 1540. ISBN 978-0-8155-1553-1. ^ Løvvik, O. M.; Opalka, S. M.; Brinks, H. W.; Hauback, B. C. (2004). "Crystal Structure and Thermodynamic Stability of the Lithium Alanates LiAlH4 and Li3AlH6". Physical Review B. 69 (13): 134117. Bibcode:2004PhRvB..69m4117L. doi:10.1103/PhysRevB.69.134117. ^ Xiangfeng, Liu; Langmi, Henrietta W.; McGrady, G. Sean; Craig, M. Jensen; Beattie, Shane D.; Azenwi, Felix F. (2011). "Ti-Doped LiAlH4 for Hydrogen Storage: Synthesis, Catalyst Loading and Cycling Performance". J. Am. Chem. Soc. 133: 15593–15597. doi:10.1021/ja204976z. ^ a b Mikheeva, V. I.; Troyanovskaya, E. A. (1971). "Solubility of Lithium Aluminum Hydride and Lithium Borohydride in Diethyl Ether". Bulletin of the Academy of Sciences of the USSR Division of Chemical Science. 20 (12): 2497–2500. doi:10.1007/BF00853610. ^ a b c Patnaik, P. (2003). Handbook of Inorganic Chemicals. McGraw-Hill. p. 492. ISBN 978-0-07-049439-8. ^ Smith, M. B.; Bass, G. E. (1963). "Heats and Free Energies of Formation of the Alkali Aluminum Hydrides and of Cesium Hydride". Journal of Chemical & Engineering Data. 8 (3): 342–346. doi:10.1021/je60018a020. ^ Dilts, J. A.; Ashby, E. C. (1972). "Thermal Decomposition of Complex Metal Hydrides". Inorganic Chemistry. 11 (6): 1230–1236. doi:10.1021/ic50112a015. ^ a b c Blanchard, D.; Brinks, H.; Hauback, B.; Norby, P. (2004). "Desorption of LiAlH4 with Ti- and V-Based Additives". Materials Science and Engineering B. 108 (1–2): 54–59. doi:10.1016/j.mseb.2003.10.114. ^ Chen, J.; Kuriyama, N.; Xu, Q.; Takeshita, H. T.; Sakai, T. (2001). "Reversible Hydrogen Storage via Titanium-Catalyzed LiAlH4 and Li3AlH6". The Journal of Physical Chemistry B. 105 (45): 11214–11220. doi:10.1021/jp012127w. ^ Balema, V.; Pecharsky, V. K.; Dennis, K. W. (2000). "Solid State Phase Transformations in LiAlH4 during High-Energy Ball-Milling". Journal of Alloys and Compounds. 313 (1–2): 69–74. doi:10.1016/S0925-8388(00)01201-9. ^ a b Andreasen, A. (2006). "Effect of Ti-Doping on the Dehydrogenation Kinetic Parameters of Lithium Aluminum Hydride". Journal of Alloys and Compounds. 419 (1–2): 40–44. doi:10.1016/j.jallcom.2005.09.067. ^ Andreasen, A.; Pedersen, A. S.; Vegge, T. (2005). "Dehydrogenation Kinetics of as-Received and Ball-Milled LiAlH4". Journal of Solid State Chemistry. 178 (12): 3672–3678. Bibcode:2005JSSCh.178.3672A. doi:10.1016/j.jssc.2005.09.027. ^ Balema, V.; Wiench, J. W.; Dennis, K. W.; Pruski, M.; Pecharsky, V. K. (2001). "Titanium Catalyzed Solid-State Transformations in LiAlH4 During High-Energy Ball-Milling". Journal of Alloys and Compounds. 329 (1–2): 108–114. doi:10.1016/S0925-8388(01)01570-5. ^ Brown, H. C. (1951). "Reductions by Lithium Aluminum Hydride". Organic Reactions. 6: 469. doi:10.1002/0471264180.or006.10. ISBN 0471264180. ^ Chen, Y. K.; Jeon, S.-J. ; Walsh, P. J.; Nugent, W. A. (2005). "(2S)-(−)-3-exo-(Morpholino)Isoborneol". Organic Syntheses. 82: 87. ^ "Red-Al, Sodium bis(2-methoxyethoxy)aluminumhydride". Organic Chemistry Portal. ^ Rickborn, B.; Quartucci, J. (1964). "Stereochemistry and Mechanism of Lithium Aluminum Hydride and Mixed Hydride Reduction of 4-t-Butylcyclohexene Oxide". The Journal of Organic Chemistry. 29 (11): 3185–3188. doi:10.1021/jo01034a015. ^ Wade, L. G. Jr. (2006). Organic Chemistry (6th ed.). Pearson Prentice Hall. ISBN 0-13-147871-0. ^ Johnson, J. E.; Blizzard, R. H.; Carhart, H. W. (1948). "Hydrogenolysis of Alkyl Halides by Lithium Aluminum Hydride". Journal of the American Chemical Society. 70 (11): 3664–3665. doi:10.1021/ja01191a035. PMID 18121883. ^ Krishnamurthy, S.; Brown, H. C. (1982). "Selective Reductions. 28. The Fast Reaction of Lithium Aluminum Hydride with Alkyl Halides in THF. A Reappraisal of the Scope of the Reaction". The Journal of Organic Chemistry. 47 (2): 276–280. doi:10.1021/jo00341a018. ^ Carruthers, W. (2004). Some Modern Methods of Organic Synthesis. Cambridge University Press. p. 470. ISBN 0-521-31117-9. ^ Bogdanovic, B.; Schwickardi, M. (1997). "Ti-Doped Alkali Metal Aluminium Hydrides as Potential Novel Reversible Hydrogen Storage Materials". Journal of Alloys and Compounds. 253–254: 1–9. doi:10.1016/S0925-8388(96)03049-6. ^ a b Varin, R. A.; Czujko, T.; Wronski, Z. S. (2009). Nanomaterials for Solid State Hydrogen Storage (5th ed.). Springer. p. 338. ISBN 978-0-387-77711-5. ^ a b Santhanam, R.; McGrady, G. S. (2008). "Synthesis of Alkali Metal Hexahydroaluminate Complexes Using Dimethyl Ether as a Reaction Medium". Inorganica Chimica Acta. 361 (2): 473–478. doi:10.1016/j.ica.2007.04.044. ^ Wiberg, E.; Wiberg, N.; Holleman, A. F. (2001). Inorganic Chemistry. Academic Press. p. 1056. ISBN 0-12-352651-5. Wiberg, E.; Amberger, E. (1971). Hydrides of the Elements of Main Groups I-IV. Elsevier. ISBN 0-444-40807-X. Lide, D. R., ed. (1997). Handbook of Chemistry and Physics. CRC Press. ISBN 0-8493-0478-4. Andreasen, A. (2005). "Chapter 5: Complex Hydrides". Hydrogen Storage Materials with Focus on Main Group I-II Elements (PDF). Risø National Laboratory. ISBN 87-550-3498-5. Archived from the original (PDF) on 2012-08-19. Look up lithium aluminium hydride in Wiktionary, the free dictionary. "Materials Safety Data Sheet". Cornell University. Archived from the original on March 8, 2006. "Hydride Information Center". Sandia National Laboratory. Archived from the original on May 7, 2005. "Reduction Reactions" (PDF). Teaching Resources - 4th Year. University of Birmingham. Archived from the original (PDF) on May 23, 2016.